The Association of Fundraising Professionals (AFP) represents more than 30,000 members in 230+ chapters throughout the world. The association fosters development and growth of fundraising professionals – promoting high ethical standards in fundraising and working to advance philanthropy through advocacy, research, education, and certification programs. The Nova Scotia Chapter is a volunteer-run organization dedicated to advocacy, education and upholding ethical standards on behalf of the membership and the philanthropic community of the Maritimes. 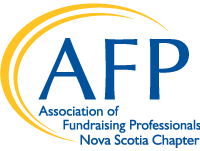 With a membership of 110+ fundraising professionals, volunteers, students and allied professionals, AFP Nova Scotia aspires to further educate, inspire and AFP members are better able to serve their profession and the public. AFP Nova Scotia is currently seeking a volunteer Treasurer for our Board of Directors for a one-year term commencing in May 2019. No director may serve more than eight years consecutively on the chapter board unless also serving as president, president-elect, or immediate past-president. A one-year break in service is required otherwise. All Directors are required to be a Member of AFP. The Treasurer of the Chapter shall ensure the fiscal integrity of the Chapter, and shall have all the powers and shall perform all the duties commonly incident to and vested in the office of the treasurer of the Chapter Board of Directors of a nonprofit corporation as defined by the Registrar for the province of Nova Scotia, and such other duties as the President or Chapter Board of Directors may designate. The Treasurer shall work with the Chapter Administrator and assist with receiving, maintaining, and distributing adequate records of the Chapter's funds in accordance with Canada Revenue Agency (CRA) requirements and any Nova Scotian government requirements. The Treasurer shall work with the Chapter’s auditors to ensure all required reports with Canada Revenue Agency (CRA) and the Registrar, Province of Nova Scotia are filed. The Treasurer shall assist in the preparation of the annual budget and monitor chapter revenue and expenditures on a monthly basis. ·Prepare an annual financial budget (each fall), including revenue & expenses budget and cash flow projections. ·Manage and oversee organization’s financial transactions, including receiving and banking monies collected and paying the organization’s employees and vendors. ·Keep accounting records in respect of the organization’s financial transactions such as bookkeeping & accounting and maintaining adequate financial books and records. ·Prepare the organization’s financial statements and reports for internal purposes (management & board meetings, etc.) and for external stakeholders (members, funders, etc.). ·Oversee the annual financial audit (April) and file the organization’s taxes. If you are interesting in finding out more or putting your name forward for consideration, please contact the Chapter President, Daphne Carter at dcarter@pier21.ca or 902-425-7770 ext. 259.